Click on the thumbnails for larger images to appear in center. All designs and patterns are copyrighted and exclusive to Buffalo Trail Artworks. 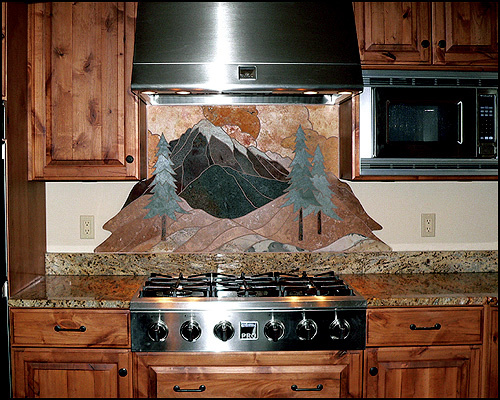 Many of these wall mosaic images show you just how fun it is to enhance a usual looking wall, kitchen backsplash, fireplace front, shower or building front into a one-of-a-kind show piece. Contact us about any of your questions or concerns you have about designing to fit your space or installation. The next gallery ( 2 ) has images of floors and entryways. Our third gallery ( 3 ) features photos of miscellaneous mosaics used in a variety of applications.